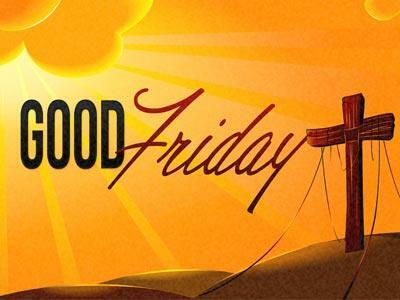 Summary: Why is Good Friday called good? Our answer to that question is determined by how we see that day’s event -- with worldy, physical eyes or Christian, spiritual eyes? Why Good Friday? Why do we call this Friday, good? This is the day that we see Christ dying on the cross. A day of remembrance like this would be more appropriately termed Mourning Friday, for that is what the disciples were doing -- grieving over their assumed loss. But then we’re faced with a hopeless and depressing gospel message. In some churches, for Good Friday, they cover all of their statues, pictures, and crosses with black cloth to symbolize the mourning they’re remembering. What’s so good about that? I’ve read that the word good used to have a secondary meaning of holy. That’s getting better! But still, what’s so holy about death? Especially God’s Son!? Granted, I’d rather call this day Holy Friday, for the word holy, applied to this day, has a much more elusive meaning. Some others of you have probably asked yourself that same question this Easter season, or during other Easters: Why do we call Good Friday, good? [Fallen Condition Focus] We ask that question and wonder about the word ‘good’ because all we see is an old form of execution, a man dying on a cross, a man that is supposed to be God’s Son, our Savior -- God in the flesh -- and yet he’s dying. [Main Point] What do we see? What do you see today? When you think of Good Friday, what do you see? 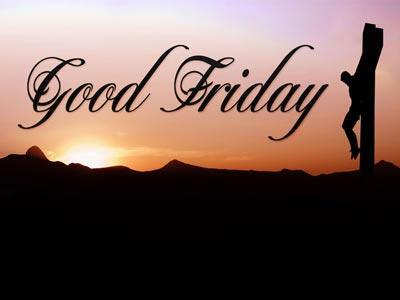 What you see on Good Friday will determine how you answer this question: Why call Good Friday, good? Here is the beginning of our solution, or answer. It’s a matter of perspective. That’s why I say that it matters how you see this day. This Good Friday, this sacrifice on the cross -- or as we read, “the message of the cross” -- is foolish to those who don’t know Christ or understand his perspective, or his purpose. They see it as a foolish sacrifice; how can you give up your life for someone? Why would you? But to us who are being saved, we understand his teaching and his life, which lays in stark contrast to the opinions and perspectives of the world. We understand why he did what he did. So there IS something that we’re not seeing. 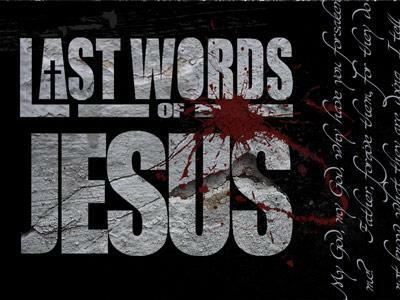 25but the word of the Lord stands forever." In other words, suffering and death last for only a short while. Physical death does not last long -- compared to eternity. To us, however, it feels like forever. But there is a life that will last forever. Our eyes are so consumed with the physical realm; we see only a death; we see only blood shed; we see a dying man -- and we ask, FOR WHAT? What is this accomplishing? Why this needless pain and suffering -- and a dead Savior? “He looked around the hill and foresaw a scene. Three figures hung on three crosses. Arms spread. Heads fallen forward. They moaned with the wind. Men clad in religion stood off to one side…Arrogant, cocky. Women clad in sorrow huddled at the foot of the hill…Faces tear streaked. All heaven stood to fight. All nature rose to rescue. All eternity poise to protect. But the Creator gave no command. ‘It must be done…,” he said, and withdrew. It’s because of what Christ’s death is accomplishing for us, that we can call this day good. Why is Good Friday called good? Our answer to that question is determined by how we see that day’s event -- with worldy, physical eyes or Christian, spiritual eyes?